B-Movie Sci-fi only gets better the bigger the monster gets! Tarantula starring John Agar, Mara Corday, Leo G. Carroll and directed by Jack Arnold, features a radiation-enhanced 100-foot-tall eight-legged monster terrorizing a remote Arizona desert community. It's big! It's hairy! It's a hell of a great release from Scream Factory! 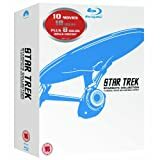 With a solid A/V presentation and a couple decent bonus features, it's another Universal International Blu-ray that's Recommended. When will these kooky scientists ever learn that no good can come from messing around with radiation? Don't they know it only ever makes small little critters big mean and angry monsters? Apparently, the esteemed and reclusive Professor Deemer (Leo G. Carroll) never got the message. 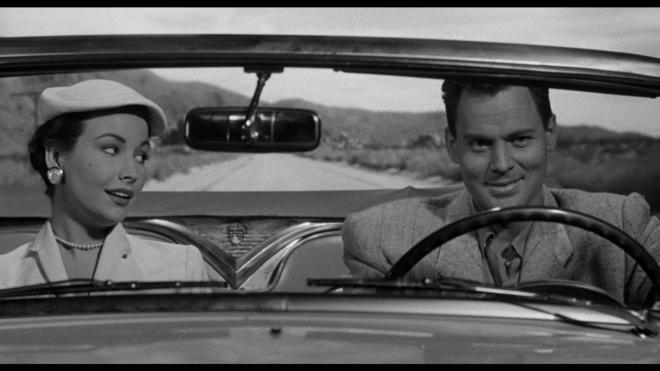 After his assistant turned up dead and deformed on the side of the road, town doctor Matt Hastings (John Agar) gets curious about Deemer's work. Unfortunately, it's apparently been destroyed in a fire - supposedly along with all the test subjects. When Deemer's new assistant Stephanie "Steve" Clayton (Mara Corday) arrives in town, Hasting's romantic tendencies will have to wait when a giant tarantula that escaped from the lab fire starts killing and eating people leaving only a heap of dry bones in its wake! Tarantula crawls on all eight legs in this wild and fun take on an old trope. More akin to Island of Doctor Moreau, the red-scare and nuclear weapons gives a new thrust to the story. Instead of trying to make animal hybrids, our maniac doctor is trying to use the most destructive force known to man and actually solve the looming hunger crisis with our unchecked population increases. After all, a huge cow can make a lot of burgers! When we first see the good Doctor Deemer's first experiments, they kinda make sense. Rats, guinea pigs - those are sensible test subjects. But why a tarantula? Well, there wouldn't be much of a movie if it was a giant cuddly hamster roaming around town would there? Now you get into the tough territory of trying to rank the giant bug movies. 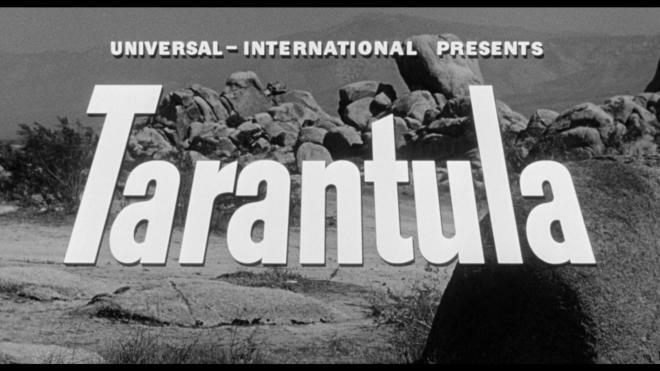 Tarantula is certainly a better movie than The Deadly Mantis - the lack of stock footage alone helps that metric. It's also a stronger movie with better effects work than Burt I. Gordon's Earth Vs. the Spider or the giant cricket feature Beginning of the End - but it's still just as silly a show as the rest of them. The thing I love about these schlocky later-run Universal International movies is just how damn committed the cast is. Agar is in fine form without being the complete smarmy know-it-all he usually is. Mara Corday offers up more than just a pretty face while Leo Carroll gets to be the mad scientist with his own gory and grotesque end! If they were any more self-aware they'd be just another gassy bloat movie the SyFy Channel would run to full a time slot. Tarantula may not quite be of the same caliber as Them! but its heart is in the right place. There's just enough moralizing about the perils of scientific discovery to have some dramatic weight, but at the same time, the picture doesn't get a big head on its shoulders. It knows when to doll out the creepy crawly monster for some delightful Spider mayhem! How MST3k missed the opportunity to give this a run is beyond me - it certainly offers up plenty of opportunity for some skewering, but even without the invitation to riff, the flick is a fun monster show that offers plenty of entertainment value for the lovers of B-movie sci-fi! 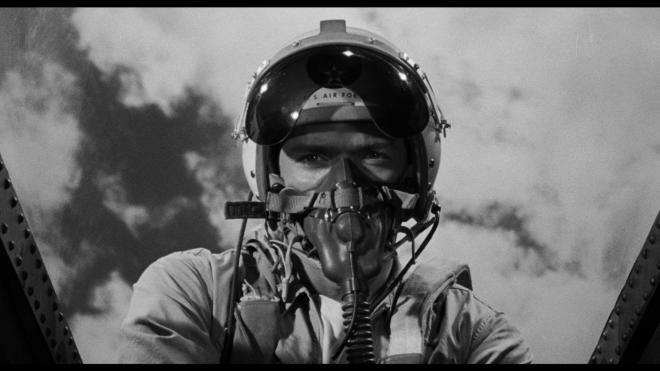 Where else are you going to see Clint Eastwood take on a 100-foot spider in a fighter jet? Tarantula craws its way onto Blu-ray courtesy of Scream Factory in a single disc set. Pressed onto a Region A locked BD-25 disc, the disc is housed in a standard sturdy case. The disc loads to a static image main menu with traditional navigation options. Sourced from a new 2K scan of the original film elements, Tarantula grows big with a pleasing 1.85:1 transfer! Really, the only negative I have to report is how the image can look decidedly rougher during the frames surrounding optical transitions. Some wide shots of the creature also show some loss of image clarity - but that's been a baked in effect in virtually every home video presentation of the film I've ever seen. It's just more apparent now due to the uptick in clarity and image resolution. Now for the very good of the show. Clarity has never been better! I've had this movie now on VHS and DVD and in all honesty, I wasn't expecting much, but this new transfer really delivers the goods. The monster makeup, the close-ups of the spider's eyes and fangs, facial features, clothing, the Arizona scenery all look amazing. Fine film grain is apparent throughout giving the image a terrific film-like appearance. Grayscale is terrific giving a full range of shadows between nice solid whites and deep inky blacks. 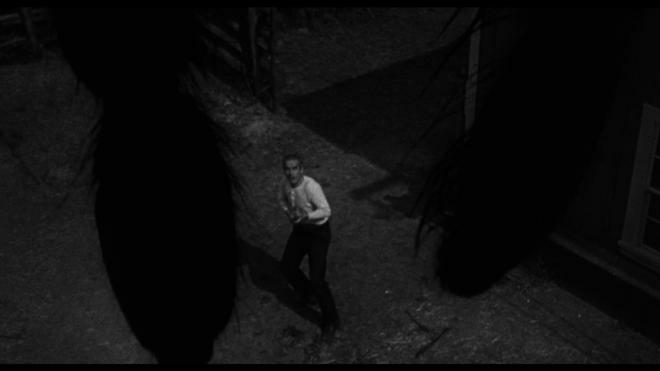 There's a notable sense of three-dimensional depth to the image that really is a gas when you go into "Spider-Vision" as the creature descends upon some hapless rancher. Elements are in great shape without any sign of age-related wear and tear. Even with it's baked in issues, this is a hell of a good looking show! Tarantula makes great use of its DTS-MD HA 2.0 mono mix. Dialogue is crystal clear without any issues from outside elements. The stock music was overseen by frequent Universal International "music supervisor" Joseph Gershenson fits perfectly with the movie - even it's the same collection of music cues you'll recognize from virtually every sci-fi movie from the studio. Sound effects are on point as well - especially the creepy crawly Tarantula that sounds like a pond full of frogs - just like the ants in Them! Atmospherics are a bit restrained by their source recordings, but scenes in the town offer enough hustle and bustle and Clint Eastwood's fighter jet give the mic plenty of punch. "Did I blow off eight legs, or only seven? Well to tell you the truth, in all this excitement I lost track myself. But being as this is a Starfighter, the most powerful fighter jet in the world and would blow your thorax clean off, you've got to ask yourself one question 'Do I feel lucky?' Well do ya, Bug!" Tarantula may not have a web-full of bonus features, but the Audio Commentary is solid stuff with plenty of insight and background information about the film. Give it a listen if you're a fan of the flick! Audio Commentary featuring Film Historians Tom Weaver, Dr. Robert J. Kiss, and David Schecter. Scream Factory continues its winning streak of bringing the Universal International classic sci-fi movies to Blu-ray with Tarantula. Featuring the ever pompous John Agar, the film is a true monster show delight with some great creature effects! The movie proves the adage the bigger the bug the better the show! Scream Factory delivers a solid Blu-ray release with a beautiful image transfer a clean and clear audio mix, and an informative audio commentary to bulk up the bonus features. 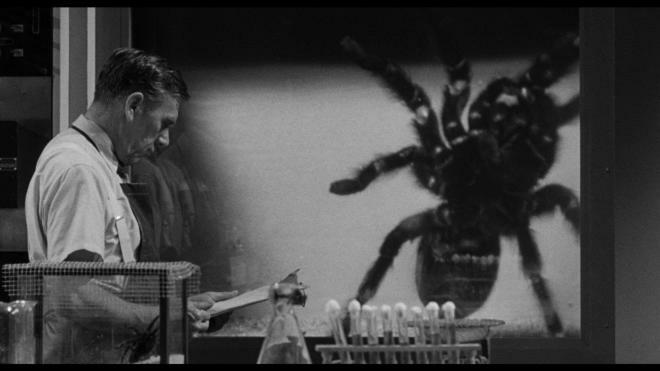 If you're in for the classic Universal B-movie sci-fi movies, Tarantula is eight legs of fun. Recommended.